Since Barack Obama seems to be doing favors for Iran hand over foot, former president Mahmoud Ahmadinejad apparently thought the U.S. president could oblige him by overruling the U.S. Supreme Court decision awarding $2 billion to the victims of Iran terrorism. 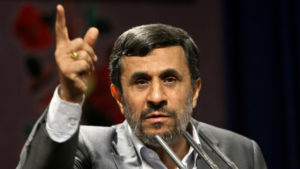 In a letter to President Barack Obama made public on Aug. 8, Ahmadinejad asked for the U.S. to unfreeze the $2 billion in Iranian foreign currency reserves that were seized from bank accounts in New York earlier this year. Ahmadinejad’s plea comes as Obama is already under fire for having delivered $400 million in cash to Iran last January on the same day four American hostages were released, money that Republican presidential candidate Donald Trump and many others have suggested amounts to an illegal ransom payment. In a press conference at the Pentagon last week, Obama said the timing of the payment, which he said was sent to settle a debt over military equipment that predated Iran’s Islamic revolution, was purely coincidental. In his letter, the former Iranian president called on Obama to return the $2 billion to Iran rather than use the money to compensate the family members of victims of the 1983 bombing of a Marine Corps barracks in Beirut, Lebanon, an attack blamed on Iran. The Supreme Court ruled in April that the seized money could be paid out to those families and others who were victimized by other incidents for which Iran is believed to be responsible, but the Iranian government has appealed that decision to the International Court of Justice. “I passionately advise you not to let the historical defamation and bitter incident be recorded under your name,” Ahmadinejad said in his letter, urging Obama not to distribute the Iranian cash.